The history of the Association is illustrious and marked by many struggles and roadblocks. The persistence and vision of Dr. Angappan, our founder, led to the formation and function of the Association from the year 1991. Using the experience he gained from starting a CBSE school and obtaining an NOC, Dr. Angappan was instrumental in guiding many people to start CBSE schools in Tamil Nadu. Under his leadership the Association started functioning in Coimbatore. Dr. Angappan was supported by great educationists such as Mr. L. Dharma Kannan, founder, Rukmani Kannan Vidyalaya, Coimbatore; Mr. V.S.V. Mani, founder, Sri JayendraSaraswathi School, Tirunelveli; Mr. Kesavachary, founder, Sri Saraswathi Vidyalaya, Maduranthakam; Mr. K. Santhanam, founder, Smt. Sundaravalli Memorial School, Chennai; Rev. Fr. Francis Thaivalappil,Viswadeepthi Hr. Sec. School, Pollachi; Sr. J. PrasannaThatti, Arokiamatha Hr. Sec. School, Pollachi; Mr. T.M. Natarajan, founder, Jaya Jaya Sankara Educational Trust, Kanchipuram; Ms. Sridevi Naidu, Breeks All India Sec. School, Ooty; Mr. S. Ranganathan, Educational Officer, Retired, Kendra Vidyalaya. 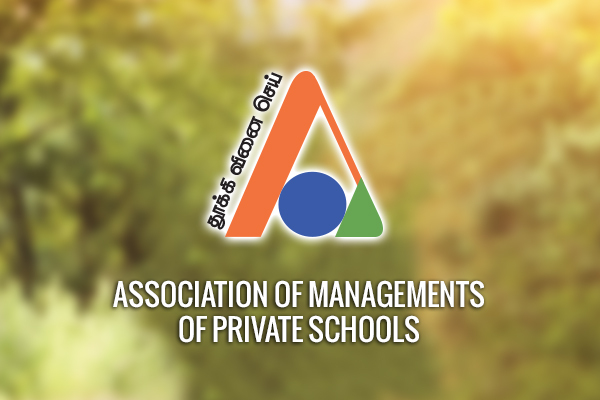 Dr. Anagappan framed the bye-laws and named the group Association of Managements of Private Schools. The Association has provided a forum for the Managements of Private Schools in Tamil Nadu to improve and enhance the educational experience of children as well as to share and find solutions to their problems. To facilitate communication and coordination, the Association amended its bye-laws and created six zones in 2015, each headed by a President and Secretary. Besides, we have also appointed Executive Committee members from each Zone. The Office Bearers, Zonal Presidents, Secretaries and the Executive Committee members are meeting regularly, once in three months, in different Zones. The meetings are a forum to share our thoughts and views. The Association also organizes workshops and seminars for teachers and school Management Professionals. Unity is strength. A united group of people can always achieve things in a stronger way than by standing alone. Our strength is in our numbers. We are celebrating our Silver Jubilee, a significant milestone of the Association, on 10th and 11th December 2016. We invite you to be a part of the Association at this important juncture.